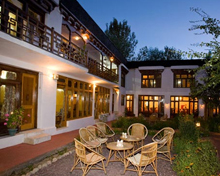 Imagine a land divorced from the modern world, nestled in the splendour of the soaring Himalayas and pristine valleys. Welcome to Ladakh, sometimes called Little Tibet. 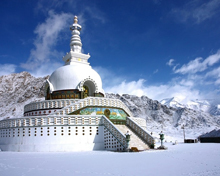 Whether you come to appreciate the soaring mountains and pristine valleys, marvel at the centuries-old monasteries, releasing your adventure pursuits, spot the rare species of flora and fauna, Ladakh, literally meaning the ‘Land of Passes’, will impress as being just about as close to paradise as it is possible to get on this planet. Each time you retreat to the snowy Himalayas in Leh-Ladakh, you discover yourself. Leh, the capital of Ladakh, is an oasis an oasis of succor in the universe of desert mountains and rarified air. While Leh city stands as a beacon of comfort and hope, the unending Morey Plains, located well above 5,000m, is home to the legendary Khampa nomads who live close to Tso-Moriri Lake. One of the most beautiful lakes in India, the magnificent high altitude lake is one of the largest and longest in the Himalayas at 25 km long and 6-7 km wide. This is the breeding ground for the bar headed geese, great crested grebe, brown headed gull and ruddy shelducks. Other birds that can be spotted here are common teal, sand plover and common terms. Pongong Lake or Pongong Tso is another important lake in Ladakh. 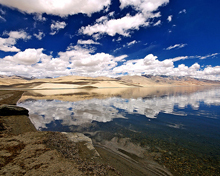 143 km from Leh, the Pongong Lake is one of the largest and most beautiful natural lakes in India. While on third part of the lake falls in India, the remaining is in Tibet (China). Magnetic Hill is located adjacent to Leh. The hill is known for its magnetic properties. You can reach the Magnetic Hill by taking the Leh-Kargil-Baltic National Highway. The Leh Palace is one of the major highlights in a trip to Ladakh. Overlooking the Leh city, the palace is shrouded in mystery. Gurudwara Patthar Sahib is another place of tourist’s attraction that is known to be the place where tenth Sikh Guru Gobind Singh, had meditated. Zanskar region in Ladakh attracts people in large number. Bounded by high peaks, Zanskar is a rugged valley. Ladakh's iconic sight is Hemis Gompa (Monastery), 47 km from the capital Leh on the west bank of the Indus. The most renowned and biggest monastery of Ladakh is known for its most popular festival, Hemis festival which is held annually in June /July. Namgyal Tsemo Gompa, Sankar Gompa Spituk Monastery, Thikse Gompa, Stakhna Gompa, Phyang Gompa, Chemrey Gompa, Tak-Thog Gompa, Likir Gompa, Alchi Gompa and Lamayaru Gompa are other important monasteries of Ladakh. Another key attraction of Ladakh is nine-storey palace built by King Singge Namgyal in the grand tradition of Tibetan architecture. Kargil is another important place in Ladakh. The place is an main base for trekking to surrounding areas of the Drass valley, Suru valley and Zanskar region. Kargil is connected by motorable road with Srinagar, Drass, Lamayaru and Leh. Those traveling between Zanskar, Leh and Srinagar usually make night halt at Kargil, before starting second day of their journey. Ladakh is known for several Buddhist festivals that bring out the extroverted side of the famously friendly people of Ladakh. Proper acclimatization is necessary for a journey to Leh. Acute Mouatain Sickness (AMS) is a very real phenomenon. Ensure you are hydrated and also pack medicines to combat it. 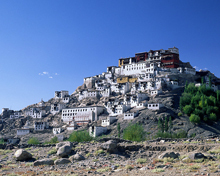 For many visitors, Ladakh is a uniquely spiritual place. People come here to seek spiritual happiness in the lap of nature. This wonderful place in the state of Jammu and Kashmir is changing. Once the travel destination of the backpackers, tourists now flock to Ladakh. When you have had your share of the laidback, get ready for some action. The area has an exceptional array of trekking routes. Mountain biking and rafting are popular too. 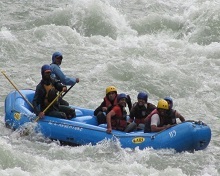 The Indus and Zanskar rivers are excellent for white-water rafting. The cold high altitude marshes of the wild and unconquered land of Ladakh are home to the majestic black necked cranes. It can be said without a shadow of doubt that you excitements will reach a crescendo as you spot these critically endangered black necked cranes which are native to only Ladakh and Arunachal Pradesh in India. They arrive during the monsoon season and leave again by late October. Once at Ladakh you will be introduced to the rich culture and heritage of ladakh. A visit to Shey marshes close to Leh would be a rewarding experience as you will spot several species of birds including Hume’s lesser whitethroat, Hume’s short toed lark, common rosefinch blue rock thrush, common coot, Eurasian hobby, booted eagle, common tern, plain mountain finch and the rock bunting. You can also find black necked cranes. Situated to the southeast of Leh, Changthang Cold Desert Sanctuary is famous for Snow leopard. The sanctuary is home to rare and endangered animals such as Tibetan argali, Wild yak, Tibetan wolf, Tibetan gazelle, and the Tibetan antelopes, The average altitude of the sanctuary is 5000m and the road here winds its way through the barren valley dotted with least vegetation. The Nubra valley is a habitat for endangered Bactrian camels. 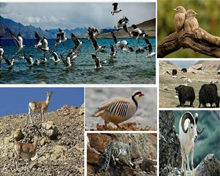 35 km from Leh, Hemis High Altitude National Park is home to some of the most exotic and rare flora and fauna species. The best time to visit the park is May to October. The myths that have grown up around Ladakh are very captivating and enticing. As a matter of fact Ladakh is a Shangri-la. Ladakh is a place that has the potential of changing the way one sees the world. It can be said without a shadow of doubt that Ladakh is definitelythe definition of the most wonderful kind of travel in the world. Leh abounds in accommodation options catering to all budgets. Hotels, guest houses and luxury camps are readily available in and around Leh, and in most popular tourist attractions such as Nubra valley. However, homestays are a great way to understand local culture and help the native communities develop sustainable tourism ad explore wildlife and nature. Himalayan homestays, supported by the Mountain Institute and UNESCO, is a well known organization that arranges homestays. There are regular flights from Delhi to Leh throughout the year. Manali and Srinagar are well connected by road to Leh. Road-travel options include bicycles, motorcycles, government and private buses, cabs and shared jeeps. For the ultimate experience, it is advised to take the road from Manali and take the flight out of Leh, as this would also help in proper acclimatization.